REPTILICUS: Godzilla Goes To Denmark – Schlockmania! From the late ’50s through the mid-’70s, Godzilla was the defining giant monster of genre cinema. Envious eyes around the globe paid attention to his international success and did their best to cut themselves in for a piece of that action. 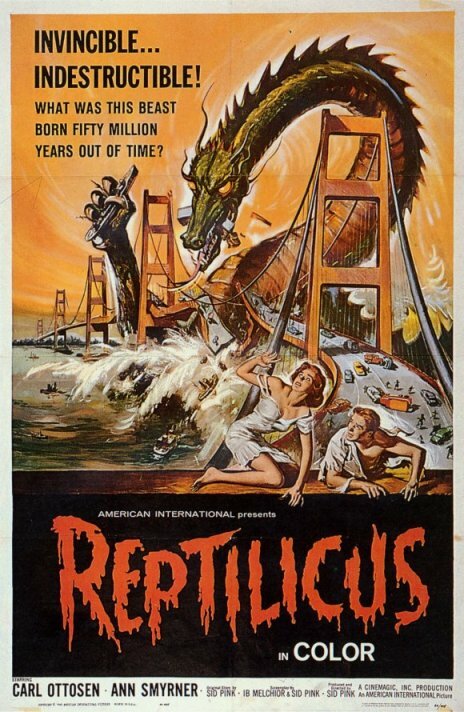 Perhaps the most odd and amusing film to emerge from the Godzilla ripoff brigade was Reptilicus. Made in Denmark and reworked for U.S. audiences by American International Pictures, it offers the goofiest of all big-screen monsters… and that’s just the beginning of all the crazy things on display here. Reptilicus has an interesting beginning in which an oil crew goes drilling and discovers they’ve drilled into a massive, reptilian fossil. They unearth a large tail that is shipped back to Denmark to be studied by Professor Martens (Asbjorn Andersen). However, an accident allows the frozen tail to thaw out and they discover it can regenerate its tissue. Further experiments lead to the tail fully regenerating a body, allowing it to bust out and stomp its way through Copenhagen. It’s up to the Professor and General Grayson (Carl Ottosen) to figure out how to put the jumbo lizard down. That said, the human scale goofups are outclassed by all of the bizarre choices made in depicting the titular monster of Reptilicus. For starters, it’s a marionette rather than a man in a suit – and it seems to have been operated by someone who was drunk because its movements are incredibly uncoordinated. The rear-projection effects are astonishingly bad, grainy-looking and artificially slowed-down in a way that makes the monster hopelessly out-of-joint with the real components. The coup de grace is an element added by A.I.P. via animation where it vomits some kind of phosphorescent green goo during its attacks. 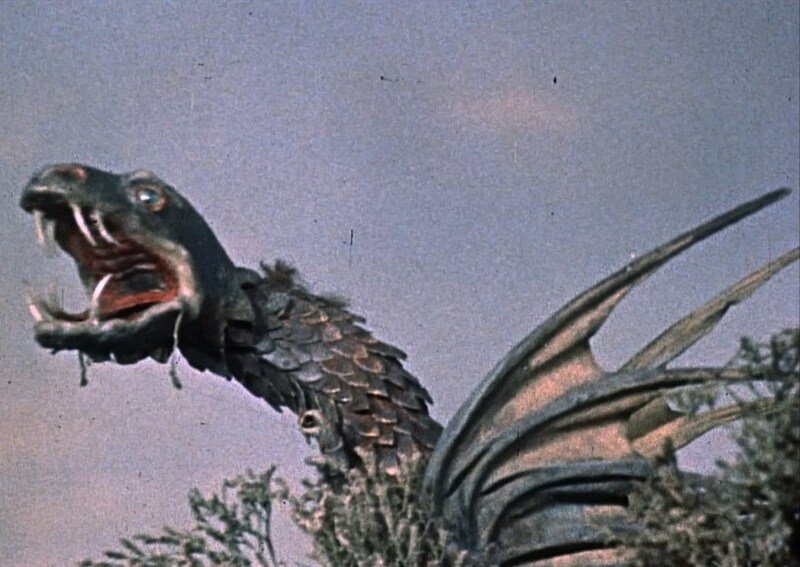 Thus, Reptilicus is truly a strange bird, full of oddball personality in a way that other bad Godzilla ripoffs aren’t. If that perverse distinction amuses you then you might get a kick out of its bizarro world approach to monster-stomping thrills. 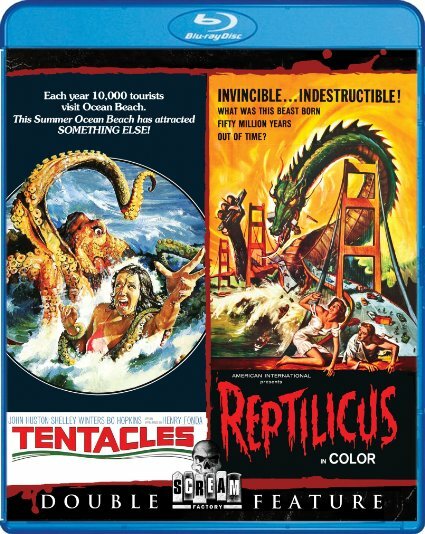 Blu-Ray Notes: Scream Factory just issued this title on a two-for-one blu-ray with Tentacles. A new transfer was done for this disc and it does well by the vintage film elements: nothing will be able to salvage the lousy optical effects but they are as crisp as they can appear and fans of the film will probably enjoy their rough-and-tumble appearance. The lossless mono soundtrack sounds fine, with an appropriate heft to Les Baxter’s booming musical score. A few extras are also included. The theatrical trailer plays up the Godzilla-esque qualities of the film, a vintage radio spot blusters in a similar way and an animated image gallery offers a colorful array of stills, lobby cards and promo art. All in all, a good deal for fans of vintage monster fare, especially with the inclusion of Tentacles to double its value.